Once you’ve had a taste of the good stuff it’s very difficult to go back. Nowhere is this more true than when it comes to bread. This year we want to give you a go at making your own to see just how amazing (and satisfying) it can be. Rather than go in at the deep end though we’re kicking off with the most simple bread of them all: the humble chapati. Prized in India for the easiness to prepare (and the fact that they’re awesome for mopping up sauce) we’re offering a prize for best chapati pic on Facebook! Put all but 2 tbsp of your flour into a high sided bowl with ¼ tsp of salt. Very gradually add water (roughly ⅓ cup) into the flour whilst you mix it with your hands. Keep mixing and adding until you have a soft (not soggy!) dough. 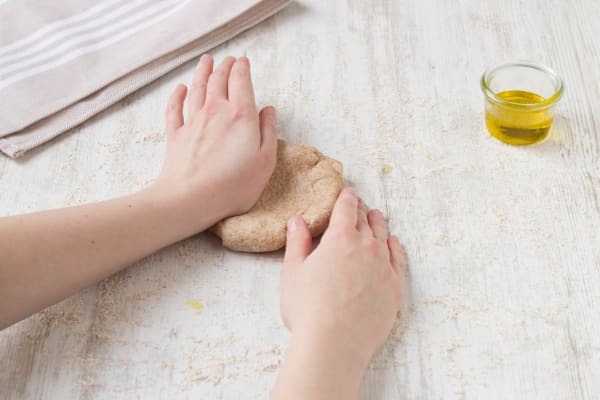 Sprinkle the remaining flour onto your work surface and coat the dough in 1 tsp of olive oil. Knead the dough by pushing it away from you on the work surface. Form it back into a ball and then push it away again to stretch it. Once you’ve pummelled it for a few mins leave it to rest. Chop the aubergine into (roughly) 2cm cubes. Peel the onion and cut in half through the root. Cut each half into slices widthways to get half moon shapes. Peel and finely dice the garlic and roughly chop the coriander. Heat a frying pan on medium-high heat. 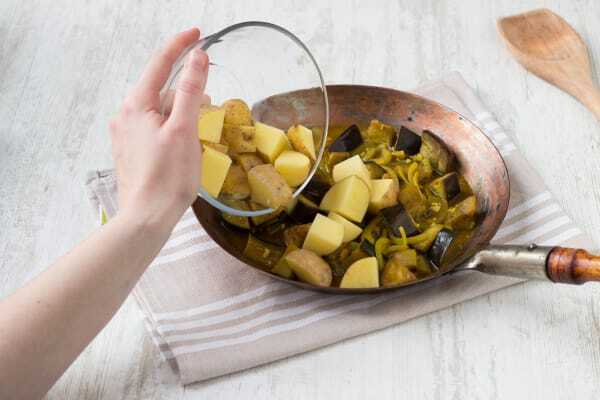 Toss the aubergine in 1 tbsp of olive oil. Fry off the aubergine cubes until golden brown (around 8 mins). Add the onion slices and the garlic to the pan and cook for 5 mins, or until soft. Add the spices and mix well, then chop (don’t peel) your potato into 2 cm cubes. Add half the stock pot to the pan with 200ml of water and stir until it dissolves. Add in the potato cubes, cover with a lid and cook for 10 mins. Remove the lid and let the sauce bubble until it has reduced by a third. Add two large handfuls of spinach (wash the leaves first if they need it). Stir well to combine everything and simmer for 4-5 mins. Remove from the heat and after a couple of mins stir through a few tbsps of Greek yoghurt . 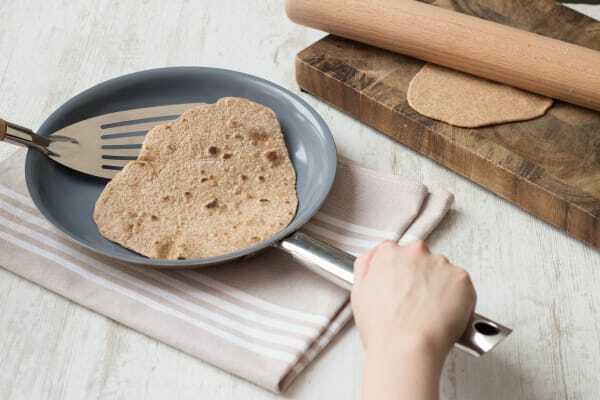 Finally, roll out your chapatis until they are as thin as a pancake. If you don’t have a rolling pin you can use a wine bottle or even a tin can! Place them in a searing hot frying pan and cook on both sides until you see little light brown spots form. 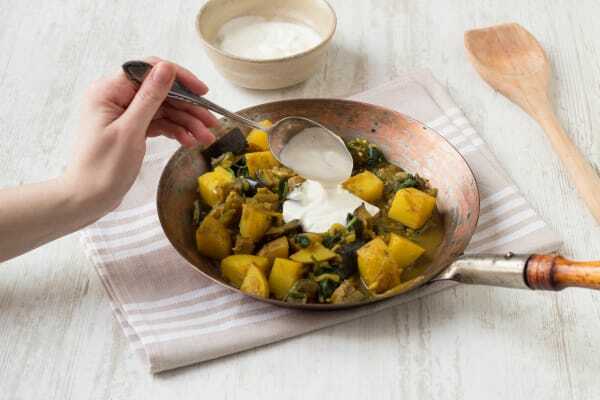 Mix 3 tbsp Greek yoghurt with 1 tsp chopped coriander, ¼ tsp of salt and a few grinds of pepper to make a ‘raita’ (AKA yoghurt sauce). 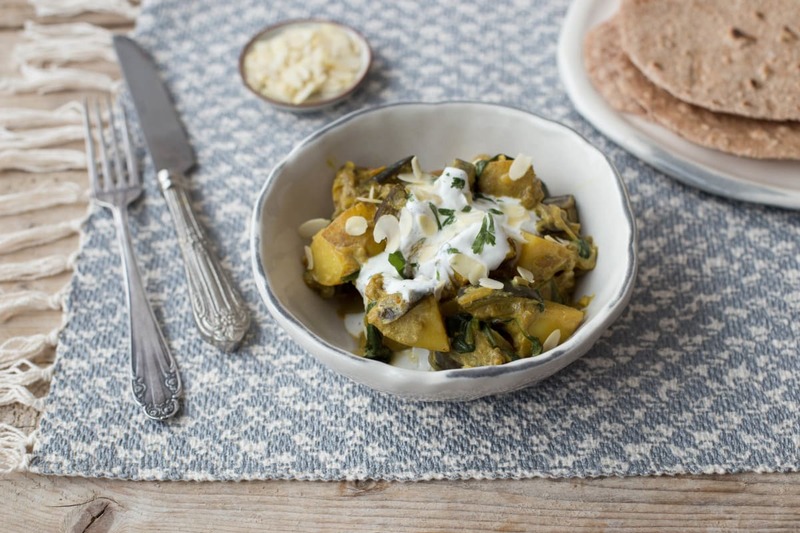 Serve the curry with the chapatis and sprinkle over the remaining coriander, the raita and the flaked almonds.